Landing at Changi International Airport it was a stark contrast to where we had just left- India. The airport was huge, modern and extremely efficient; no immigration queues, bags waiting and clear signage. Of course we did land early morning at 6am and it may be different at other times of the day, but it was nice to be back in a modern city. We opted for the metro train (subway or underground) rather than a taxi. One for cost but also research had shown it would take us very close to our hotel quickly. One downside however; all the cash machines gave us 50 Singapore dollar notes; ticket machines only accepted lower denominations (2s and 5s); and the ticket office didn’t open till 8am, so we couldn’t buy a tourist pass. Once we found some change we were on our way. The metro system reminded me a lot of Japans. Driverless trains, safety gates, wide trains, electronic signs noting exactly where on the line you were etc. Plus they are air conditioned- essential for the humidity. After one change and 4 stops we arrived at our station. We walked the short distance, strapping our bags to our backs. Our hotel was located in the Geylang district, outside of the main city but within a 5/10 minute metro journey. We couldn’t check in as it was early, and early check in was expensive, so we used the wifi to load up our maps and head into town. Both being tired from our night flight and getting almost no sleep our intention was more of a orientation walk than anything else. We got off at Raffles Place and made our way to the harbour. It was hot. The humidity was 80%. The harbour and Merlion park are amazing. Beautiful views of Marina Bay Sands (3 tower hotel complete with ship on top) and the tall city scape. The iconic Merlion was covered in scaffolding, but as luck was having it workers were busy taking it down, so we opted to come back the next day to take pictures. We wandered around the city, seeing the National Gallery, Parliament and Supreme Court (that looked like a giant flying saucer). Fort Canning Park was nearby so we walked up the steps and toured around (as well as being bitten by Mosquitoes). By this time it was late morning and we were both flagging. So we began looking for a metro station and food. Namely McDonald’s as we hadn’t had a burger in 5 weeks let alone any beef. However in our tired state it took us quite a while, but we eventually found one (there are many I’m not sure how we missed them). Fed and watered we headed back to hotel where we could now check in a get some well deserved rest. That evening (being Saturday) we went and found some local bars and had a few drinks. The food but particularly the drink/booze in Singapore is expensive. A pint was 12 Singapore Dollars, about £7. So the budget wouldn’t stretch to too many. The following morning with slightly cloudy heads and lighter wallets, we went sight seeing. 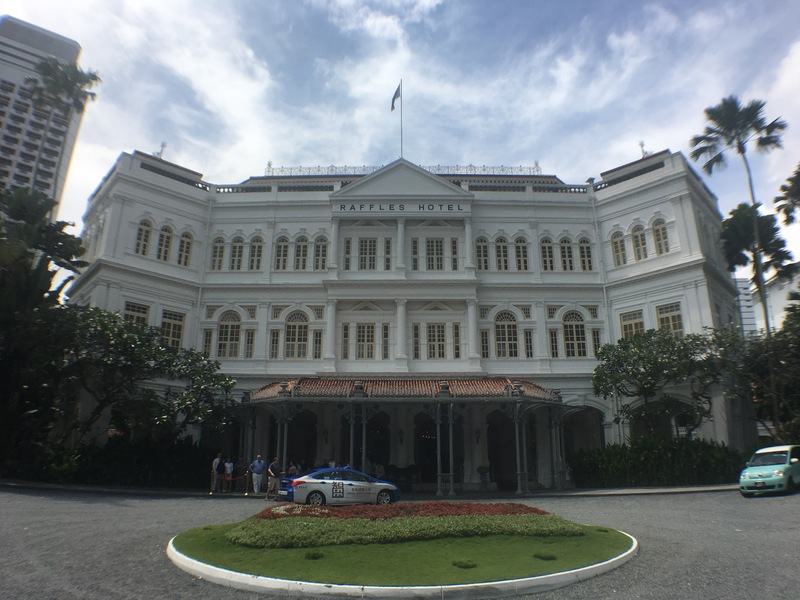 First stop was the world famous Raffles Hotel, for a Singapore Sling. At 32 Singapore Dollars each they weren’t cheap (plus the tax on top they were 40 each), but the atmosphere made up for it as we ate the free peanuts and as is traditional dusted the shells on the floor. One of the only places you can litter in Singapore! Wandering through the city, Mike flew the drone for some views of the beautiful architecture. 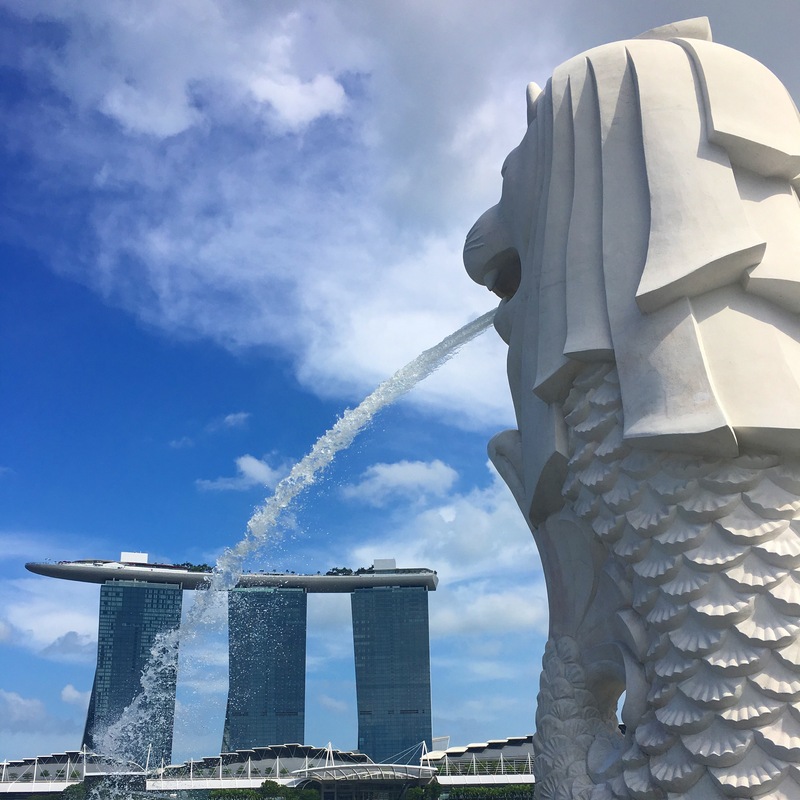 We headed after to the harbour and took photos of the now scaffold free Merlion spitting water out over the harbour. We walked around the esplanade and to the other side, over the helix bridge. 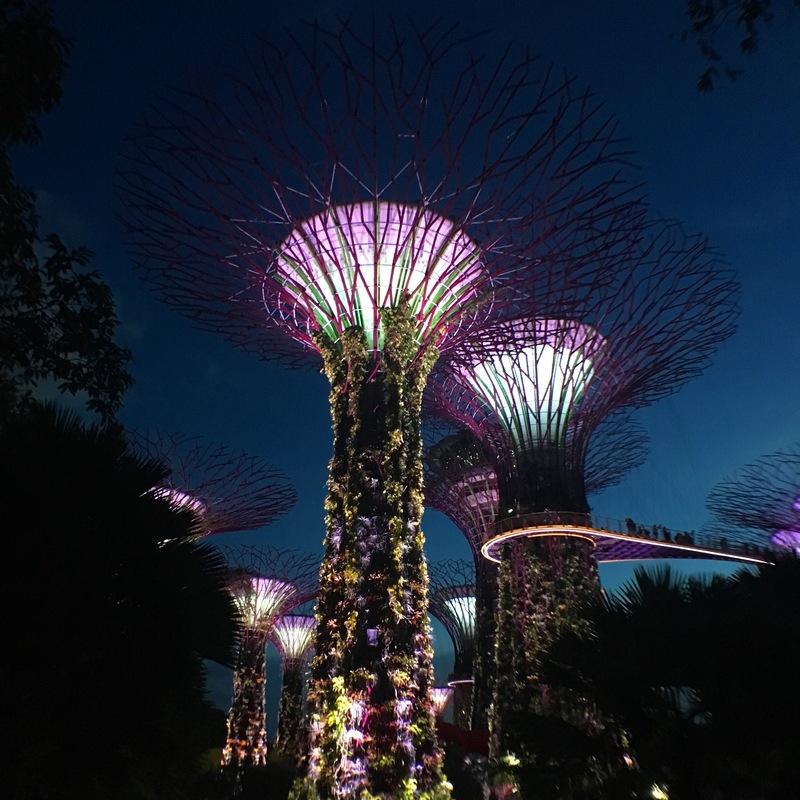 Here were the so called Gardens by the Bay and the famous Super Trees. Enormous man made purple trees that plants have been encouraged to grow up, set in the beautiful gardens. Avoiding an afternoon shower and after taking some pictures we wandered into the impressive Marina Bay Sands hotel. After some helpful advice from the concierge we went up to the bar on the 57th floor of tower 3. 20 dollars each, but that was then taken off the price of drinks at the top so not bad in the long run. The Cie La Vi bar held breathtaking views, mainly of the city scape to the west but also to the East and the Super Trees and gardens. Guests of the hotel also enjoy an infinity pool with views of the city. We were quite jealous and decided if we came back we would stay here!! 5 beers later we descended the bar to watch the light show on the harbour. Evidently we were stood in the wrong place so it wasn’t as spectacular as it could of been. Instead we wandered back across the bridge and flew the drone around the harbour to get some spectacular views at night time. Now hungry we grabbed some street food from Glutton Bay and watched the light show (again but this time from the other side). Still wasn’t quite the right place but oh well, the lasers and lights were fun. The flowing day we headed to Sentosa Island. We hadn’t done any real research but knew it was a popular destination. Sentosa is basically a small island with lots of theme parks built for families and children. It contains water parks, universal studios as well as beaches and various other activities like indoor sky diving and laser quest. If your looking for family fun and activities for the kids, this is the place for you. 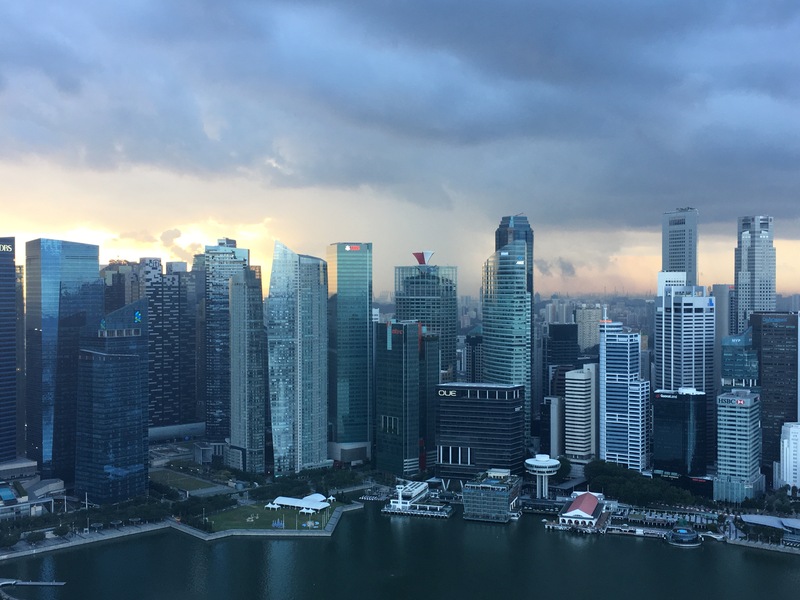 If you’re looking for culture, architecture and getting a sense of the real Singapore then it isn’t. If we had had a bigger budget and weren’t back packing around the world but where there on a weeks holiday, I’m sure we would have had more fun. As it was we spent about 45 minutes there. 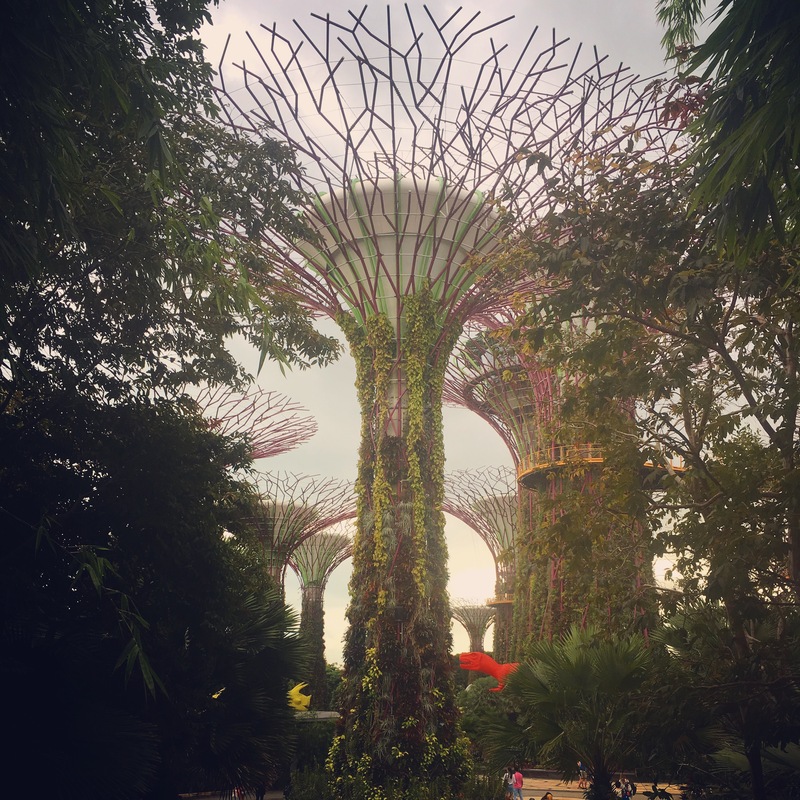 We decided instead to go to the cloud forest dome and flower dome in the Gardens by the Bay. Upon arrival we discovered the Cloud Forest was closed for maintenance. We were quite disappointed and had signs been up the day before (as we were in the exact same spot) we could of done it then. Alas it wasn’t to be. Instead we hung around the city, soaked up the atmosphere and ate some street food and ice cream. In the evening we entered back to the Supertrees to watch their light show. Among the crowds all laying down on their backs and looking up we watched the dazzling trees come to life with music, changing colour with the beat and sparkling in the night sky. Quite relaxing and peaceful. We headed back to the hotel having loved our stay. We could of planned a few things better but overall it is an amazing modern city, one we want to visit again.